Providing you the best range of ccs wire ( copper coated steel wire) with effective & timely delivery. We are the manufacturers of Copper coated steel wire.We are having the wire coating plant .We can give the wires as per the customers requirements of various conductivity ranging from 18 /23/26/32 etc.And as per the requires wire swg. 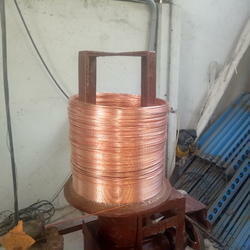 Looking for Copper coated steel wire ?